The rights and responsibilities of students when renting in the private sector while at university. Know your rights and responsibilities to make renting your student home as easy as possible. Renting your first place in the private rented sector while at university can be a daunting task, but it needn’t be with all the measures the Government has put in place to drive up standards and protect tenants. Knowing your rights – as well as your responsibilities – ensures you’ll live in a safe and comfortable environment and will be able to hold your landlord or agent to account if certain standards aren’t met. There are lots of things the Government requires landlords to do. To make understanding all this simple, we’ve put together a definitive guide to renting that tells you everything you need to consider, know and do. Your landlord or agent must also provide you with all the information on the scheme they’ve used within 30 days. If they fail to do either of these things they lose their ability to evict you with a section 21 notice. There is a useful guide on what to do if your landlord breaks your tenancy deposit protection scheme rules available from Shelter. The rules around houses in multiple occupation (HMO) will be changing on 1 October 2018. Among other things, the new rules set out a minimum bedroom size; no less than 6.51 square metres for a single adult. They also make it mandatory for landlords to adhere to council refuse schemes and ensure their properties have adequate waste facilities. Councils may give landlords up to 18 months to make changes to ensure their HMOs comply with the bedroom size rules, but if you’ve just taken out a two-year tenancy you should consider now how these rules will affect your property in the future. It is your landlord or agent’s responsibility to ensure the property is kept up to standard. This includes arranging prompt and certifiable repairs when utilities like gas, water and electricity fail, repairing or replacing faulty appliances, and maintaining the condition of the property. These schemes provide help in resolving disputes between landlords, agents and tenants, and are a safeguard for when you’re unable to resolve a dispute yourself. More detailed information on everything contained in this article is available in our How To Rent guide – which your landlord must provide you with at the beginning of your tenancy – and our How To Rent a Safe Home guide. Savvy students know their rights. 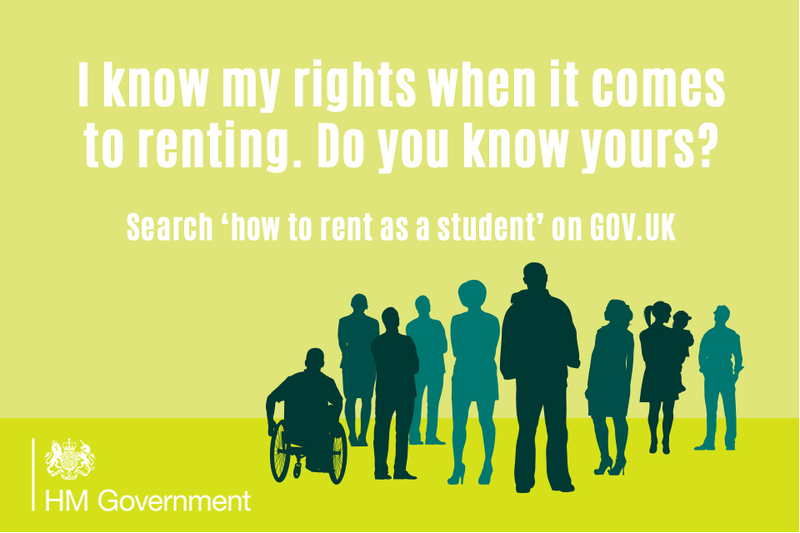 Share this article on social media and use the below image to tell other students you know your rights when it comes to renting. If you’re a university or student union, download our helpful poster and display around campus.